amadan is finally here, and subhan'Allah the time has passed so quickly! In the coming weeks, you may be planning to focus your energy on worship and Qur'an. 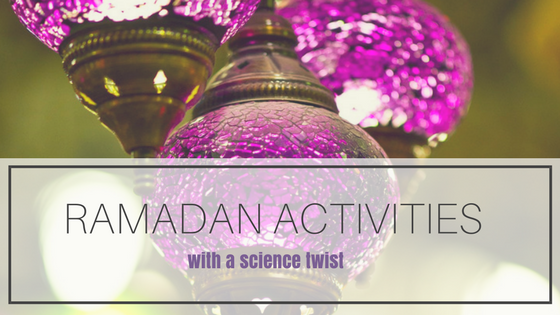 Below are four fun Ramadan activities with a science twist so you and your children can make the most of this month while incorporating secular studies. Bake cookies to learn moon phases. The best part about this activity is it's edible! Who doesn't love sweets? With your assistance, have your child prepare their favorite cookie recipe. Chocolate chip, double chocolate, sugar cookie, peanut butter, snickerdoodle—the possibilities are endless! Molding dough balls into the various shapes in one moon cycle is a great exercise for tactile learners. The process of formulating the recipe, measuring each ingredient, and mixing components will help sharpen your child’s accuracy, precision, and attention to detail. All of these skills are crucial to building a sound foundation for experimentation. Consider baking a handful of crescent moons to gift to family, friends, and neighbors. The basis of a countdown calendar is to track the days of Ramadan counting down to Eid. These are super simple to craft and subject to your creative interpretation. I chose to create a magnetic calendar this year. I designed 30 tags to represent the 29 or 30 days of Ramadan. Each tag is numbered and contains a small illustration of the predicted moon phase for that day. The tags are printed on white card stock, cut out, and a small piece of magnetic strip is adhered to the back. Each tag will be removed from the refrigerator after iftar, and we’ll observe the sky for the illustrated moon phase on the tag. Bear in mind, this isn’t the only way of making a countdown calendar. You can draw on poster board, string dye cut-outs on a piece of twine, or whatever else your heart desires. Doodle in a moon journal. After gazing up at the sky each night, have your child draw a picture of the moon. This is ideal to observe the moon’s progression through each of its phases. You should also be able to sight the waxing crescent moon, firsthand, marking the beginning and end of the fast. Crafts are great for visualization, and they're fun! The moon, though actually always round, appears as different shapes depending on its relation to the Earth and sun at the time. Try the craft above to help demonstrate the relationship between the Earth, sun, and moon. 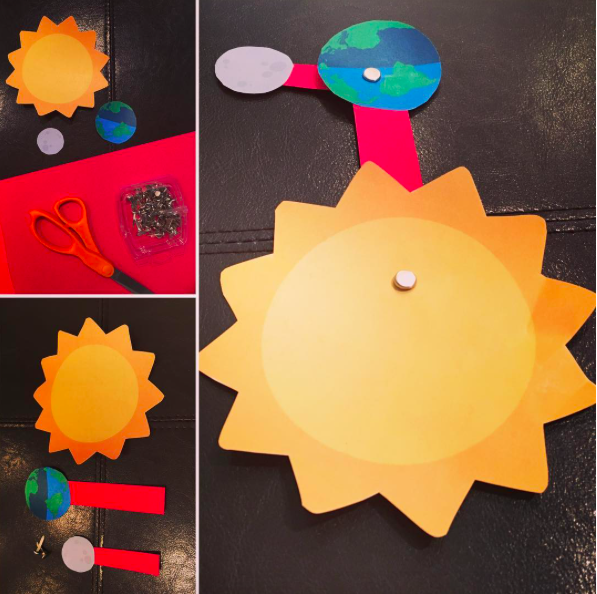 Simply, cut out the Earth, sun, and moon illustrations in the free printable below. Cut out two strips of construction paper, one piece roughly 2 x 11 in. and the other roughly 2 x 6 in. Center the Earth at the edge of the longer strip of paper, and glue in place. Center the moon at the edge of the shorter strip of paper, and glue in place. Center the sun at the opposite edge of the longer strip of paper, and place a pushpin through the center. Now, center the Earth at the opposite edge of the shorter strip of paper, and place a pushpin through the center. The moon should be able to freely revolve around the Earth, and the Earth-moon complex should be able to freely revolve around the sun. Looking for more activities and crafts? Check out our moon phases activity pack!